One of the world’s largest Christian youth gatherings returned to Atlanta for two weekends of worship, music, and community outreach for its biggest year yet. 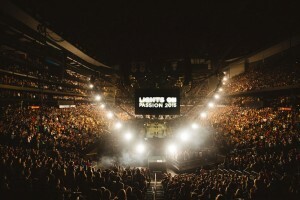 Passion 2015 welcomed a congregation of nearly 20,000 young adults and community leaders from around the world to gather under the lights of Philips Arena for the annual three-day celebration of unity, awareness, and faith. Passion has united like-minded college students between the ages of 18-25 for nearly 20 years, but the weekends of January 2-4, 2015 and January 16-18, 2015 marked the first time in its history the event has hosted two weekends at the same facility. According to Christian News, this year’s conferences attracted young people from more than 20 countries and over 1,000 universities in an effort to learn more about their faith, while also benefiting local communities and those across the globe. The gathering in Atlanta featured messages delivered by Louie Giglio, founder of the Passion movement and pastor of Passion City Church, as well as inspirational words from notable speakers including Francis Chan, John Piper, Christine Caine, Lecrae, and many others. Both weekends also included worship through music led by The Passion Band featuring Chris Tomlin, Christy Nockels, Kristian Stanfill, and Brett Younker. Although worship is the main focus of the Passion Conferences, one other very important topic of discussion is the global concern regarding modern-day slavery. According to The Christian Post, in recent years, attendees of the conference as part of THE END IT Movement have given over $7 million to provide awareness, prevention, rescue, and restoration to fight modern-day slavery. With community outreach and charity also being two of the major driving forces behind this conference, attendees were asked to bring nonperishable items to be donated to help Atlanta’s homeless. As in year’s past, the organization collaborated with Atlanta’s City of Refuge homeless ministry to donate the items. 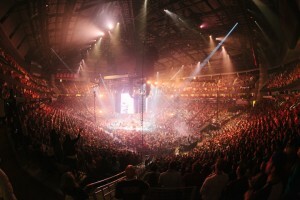 Though the conference was held during two three-day weekends in Atlanta, Passion was also brought to the Toyota Center in Houston during the weekend of January 30-February 1, 2015 for a third installment to broaden their outreach. 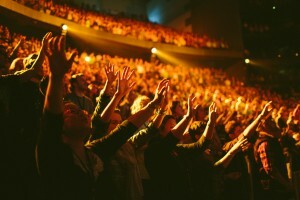 The Passion Conferences originally began in 1997 operating as a national event, but in 2008, the organization launched a global tour which has now visited 17 different cities across 16 countries. Those who have attended the conference can tell you, Passion is more than just an event; it is a movement amongst young adults to promote unity and a global awakening of faith.